We are excited to share that Clutch, a B2B research, ratings, and reviews firm has recognized Pixel Me Pink as a Top Web Design Agency in Austin. In their published annual report, the top-performers featured were evaluated on their market presence, work quality, services offered, and client feedback. Our company is also featured on Clutch’s sister website, The Manifest, who identified Pixel Me Pink as a leading Austin Web Design Agency. Based in Washington D.C, Clutch provides in-depth insights to aid buyers looking for service providers while The Manifest is a business news and how-to website. Clutch’s research is based on independently conducted reviews where former clients have the opportunity to provide their feedback about their experience working with the company. Clutch’s Leader’s Matrix maps out service providers based on their ability to deliver and area of focus. The leader’s matrix below highlights Pixel Me Pink as a leading firm in Austin Web Design. The importance of websites for small businesses has become increasingly significant along with the necessity of managing your company’s online presence through mediums such as social media or third-party reviews. Astoundingly, 85% of consumers find local businesses online while nearly 40% of small businesses do not have websites. Due to the growing importance of websites for businesses, this recognition from Clutch as a leading web design firm is especially meaningful to us. 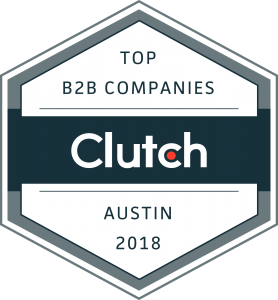 We look forward to hearing more about what our clients have to say on Clutch in 2018 as well maintaining our position as a leading web design firm in Austin!